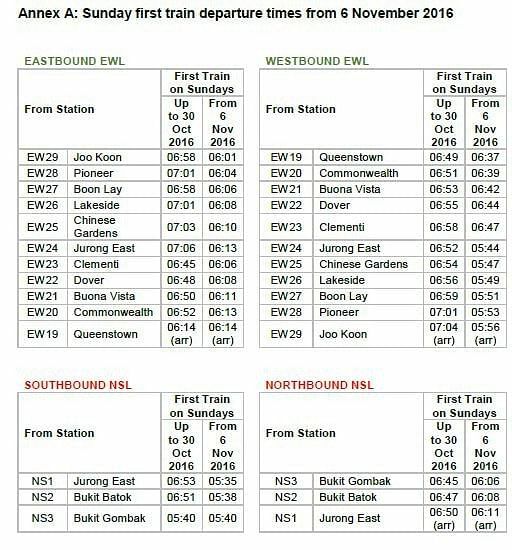 From the first Sunday of November (Nov 6), SMRT train services will resume regular service start times on Sunday mornings from Joo Koon to Queenstown on the East-West Line (EWL), and from Bukit Gombak to Jurong East on the North-South Line (NSL). SINGAPORE - From Nov 6, SMRT train services will resume regular service start times on Sunday mornings from Joo Koon to Queenstown on the East-West Line (EWL), and from Bukit Gombak to Jurong East on the North-South Line (NSL), SMRT said in a press release on Monday (Oct 24). The resumption of regular service start time on Sunday mornings at these 13 stations comes seven weeks ahead of schedule. Since June, services at 13 stations along the EWL and NSL have been commencing service up to an hour later. This was done to give rail maintenance and renewal project teams more time to carry out necessary works in between services. The initial plan was to start train services on Sundays later over a six-month period but this has been shortened to 22 Sundays instead. Over the past 20 weeks, more than 2,300 sleepers and more than 3.2 kilometres of additional Third Rail have been replaced. Mr Lee Ling Wee, managing director for SMRT Trains, said: "We thank commuters for their patience and understanding for bearing with the late opening of 13 MRT stations on Sundays since June this year. The additional time of one hour per week over the last 20 weeks, for part of the network, has been beneficial in supporting maintenance and track renewal work that is carried out every night." A paid parallel bus service has been plying the route between Joo Koon and Bukit Gombak stations to cater to commuters before 7am on Sundays since June 2016. The last day of service for this paid parallel bus service will be on Oct 30 as normal train services resume on Nov 6.